After I’ve worked in the garden, I like to brew a cup of tea and sit and read. Depending on my mood, I choose fiction or non-fiction. In the non-fiction world I see books as being light, medium or heavy “reads”. 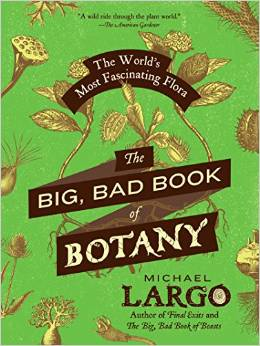 For the light read, pick up the The Big, Bad Book of Botany by Michael Largo. This is a selective encyclopedia of plants that define the plant kingdom. While there are some similarities with Amy Stewart’s Wicked Plants – many of the plants have poisonous attributes, there is more about how plants have evolved to carry on the business of surviving in all types of environments. I found myself flipping through the book to my favorite plants, like lavender, and then searching out plants that were new to me. I was amazed to learn that rattan, which I think of as a component of outdoor furniture, has been developed into a bone substitute that is not rejected by the human body. One little nit-picky point: fungi are included, and technically, they are not plants as they reside in their own kingdom. But, the illustrations are intriguing, and Largo’s writing style is easy to digest. 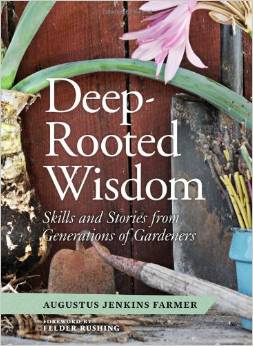 For a medium read and for inspiration, check out Deep-Rooted Wisdom: Skills and Stories from Generations of Gardeners by Augustus Jenkins Farmer or “Jenks”. The table of contents exemplifies what this book is offering: Building Fertile Soils: Encouraging a Healthy Web of Life, Stop the Tilling Cycle: Harnessing the Natural Powers of Worms and Mushrooms, Saving Seeds: Treasuring Heirlooms for Genetics and Nutrients and more. I started with the last chapter first: Finding the Spirit: Telling Stories through Your Garden. In my own garden, I am greeted by stories every time I am in it, and I was curious to see Jenks’ interpretation of this essential part of the garden. Each chapter showcases two teachers who explain their techniques and where they learned them. Jenks then explains how that wisdom is expressed on his organic farm and nursery. I am not done with this book as it takes time for each chapter to settle into my own gardening philosophy. The pictures are gorgeous, and the text is poetry. 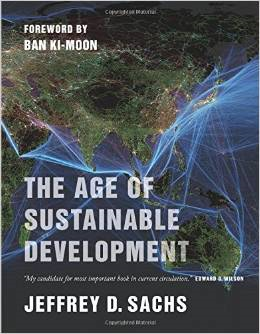 And, now for the heavy read: The Age of Sustainable Development by Jeffrey D. Sachs. I am half-way through… whew. If you want to understand the opportunities and threats to sustainable development from a worldwide perspective, this is the book you need to read. For instance, a nation has an advantage if it has coastal areas, access to freshwater, good medical care, benevolent weather and energy resources. A nation will be disadvantaged, if it is landlocked, water stressed, has a heavy disease burden (e.g. malaria), has natural hazards (e.g. earthquakes, typhoons) and has a lack of energy resources. The maps and charts are an excellent addition to the text. Without them, I’m not sure I would be able to navigate this tome. The first two books are more personal or local in nature, while the last book offers a global view. This falls right in line with the phrase: Think globally, act locally. Isn’t that what all gardeners do?